Designed by Rollin Thurlow, Atkinson, Maine. The Atkinson Traveler is a high-volume canoe, with sharp entry lines and minimal rocker making it an excellent choice for long expeditions. Standard construction includes half ribs and no keel, and covered in #10 canvas. 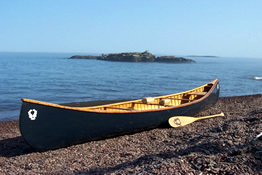 Rollin Thurlow used the 18'6" E.M.White Guide canoe which he and his partner Jerry Stelmok had been building for nearly 10 years to design a shorter, slightly lighter canoe which is visually much like it's parent. He added 1 1/2 inches of rocker for more maneuverability, a slight tumblehome, and increased the width proportionally to retain as much weight carrying capacity as possible without sacrificing the White's beautiful sharp lines and ease of paddling. The new owners of the canoes we have built, or helped them build, find this design an ideal compromise between stability, weight carrying capability, maneuverability and speed. But then - any wooden boat owners (or builders) fall in love with whatever they are paddling and become comfortable with that boat's handling characteristics. Every design represents some kind of compromise - even if this one is as close to perfect as possible. If you are used to paddling aluminum canoes like a Grumman or Alumacraft, or similar models of fiberglass or plastic canoes you will probably find the initial stability - or tippiness - of this canoe a bit disconcerting. Canoes designed for novice paddles have a flatter bottom and are wider farther into the ends to give them more stability - though this conversely makes them harder to push through the water and creates a noisy wake at about the bow person's seat. This canoe slices the water quietly and quickly, with much less effort than perhaps you are used to. While more "tender" (tippy) than some (it isn't anywhere near as tippy - or as fast - as a 30 pound racing canoe), the Thurlow design has excellent secondary stability, which means that after it is a little on it's side it doesn't feel like it wants to turn all the way over. The Atkinson Traveler is a joy to paddle solo, in flatwater or whitewater, and should prove to be a good choice for extended wilderness tripping for tandem paddlers or shorter trips with three people. Weight carrying capacity depends much on use and personal preference. We have found that loaded with 700 pounds the canoe still has a surprising 7 inches of freeboard and paddles "OK." Personally, I think it looks too heavy and probably close to 600 pounds would be more comfortable to start a long trip. In the end, the best way to judge whether or not a canoe is right for you is to get in it and paddle!